When CIA analyst Vivivan Miller pursues a Russian sleeper cell on American soil, she discover a secret that tests her loyalty to both the agency and to her family. What do you do when you discover your husband could be a sleeper agent? Need to Know centres around CIA analyst, Vivian Miller. The author, Karen Cleveland, worked for eight years as a CIA analyst, so knows what she’s talking about! Vivian and her team are working to uncover Russian sleeper cells in the USA. When she accesses the computer of a suspected Russian spy, she’s stunned to find among the photos of the five sleeper agents, someone she knows very well – her husband, Matt. I know what you’re thinking – “spoiler alert” – but the information is revealed not only on the cover but also within the first couple of chapters. The book revolves around Vivian’s choices. She should turn her husband in – it’s her responsibility. He even tells her to do it. She loves her husband, and even though he admits everything, she still can’t quite believe it. They have four children, one of whom has a medical condition and whose treatment places financial pressure on the family. Matt has been her rock – what would she and the children do without him? Vivian must make several difficult choices, each causing her a great deal of anguish. There is no black and white here. Her conflict is believable and you understand her motivation for the choices she makes. To resolve the situation, Vivian performs one small task. And then another. Suddenly the Russians have their hooks into her, and before long, she’s in deep. So how will she and her family get out of it? And people die. The author keeps you guessing – is Matt a bad guy? Is he a good guy? The story is told from Vivian’s point of view, so we know what she’s thinking and feeling. Her conflicting emotions – caught between her love for her husband and children and her knowledge that not turning her husband in amounts to treason – make for a nail biting, suspenseful story. 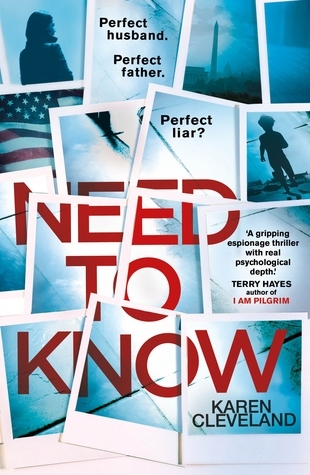 Fast paced, well written, and with believable, flawed and very human characters, this book is a gem of a thriller that keeps you turning the pages. I was completely hooked – and as the story neared its end, I was certain I knew exactly what was going on. And just as I was feeling all complacent, a final, stunning twist left me picking my jaw up off the floor.